Facebook Marketing is a key concept to getting in front of potential marketers and getting results with Prospecting. There are tons of workable Ideas, tips and concepts that you can apply to get the most from your efforts in Prospecting on Social Media, although many haven’t figure out the correct approach to stay out of the Facebook’s radar. Their wrong efforts can cause what is known as Facebook Jail. This is were Facebook warns you for suspicious behavior and if the practice isn’t changed you could be banned for several days without the permission to post anything to your wall or the news feed. We will in this video below share with you three tips that can prevent this from happening. 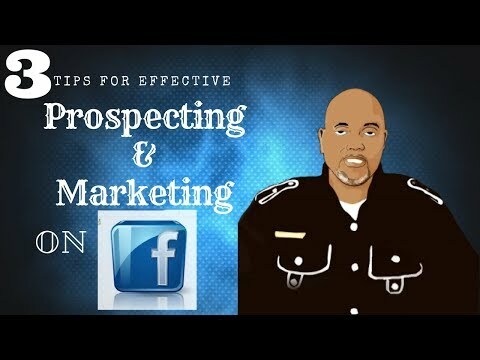 Let’s talk about these tips in general when it comes to Facebook Marketing and prospecting on social media. Facebook is set up as a social club, not a business platform when using your profile. You must keep this concept in mind. People come to Facebook to interact with friends and too see friends pictures and videos with the some exceptions of entertainment on occasion. Remember that no one comes to Facebook to buy anything especially when it is a unsolicited link thrown at them with a agenda to sale something. People want to buy although they don’t want to be sold. This is a big No No when it comes to Facebook Marketing. Here are some few statements and wrong approaches that I see common on Facebook. The list goes on and it’s not that these options are bad, it’s just that the masses are doing this and it’s not professional. You are using what is known as RESISTANCE MARKETING. You must establish a need with a curiosity post and allow the potential prospect ask you about your product or service. Everything about sales is about your Unique Selling Opposition and people want to connect with people that have a genuine interest to help them accomplish what their concerns are. In others words be a person of solution’s instead of creating frustration with people. Make sure that your values are to create harmony and continuity. Keep in mind that you must be more about people’s interest than you do about your selfish agenda because non verbal communication is 97%. I hope you have found value in this post and if you have Like, share and comment to give me your thoughts.